So excited to be a nominee for the Dante Rossetti Book Awards for Young Adult Fiction! My book, Change of Chaos, is on the long-list for the award, and will now be competing against 32 other YA Fiction books who made it through the first round of judging to make the short list…as a self-published author, this is very exciting! 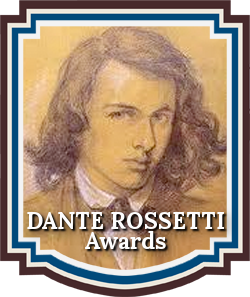 The Dante Rossetti Book Awards recognize emerging new talent and outstanding works in the genre of Young Adult. The Dante Rossetti Book Awards is a genre division of Chanticleer International Book Awards. Rossetti Book Awards is looking for the new best books featuring stories of all shapes and sizes written to an audience between the ages of about twelve to eighteen. Science Fiction, Fantasy, Dystopian, Mystery, Paranormal, Historical, Romance, and Literary. These titles have moved forward in the judging rounds from SLUSH pile to the 2018 Rossetti Book Awards LONG LIST (aka the Slush Pile Survivors). We incorporate the Long List when the judges request an additional round of judging to accommodate the number and/or quality of entries received. These entries are now in competition for the 2018 ROSSETTI SHORT LIST. Short Listers will compete for the Semi-Finalists positions. Semi-Finalists will compete for the coveted First Place Category Winners of the 2018 Rossetti Book Awards in the final rounds of judging. The First Place Category winners will automatically be entered into the Dante Rossetti GRAND PRIZE AWARD competition. The 16 CBR Grand Prize Genre Divisions Winners will compete for the CBR Overall Grand Prize for Best Book and its $1,000 purse. First Place Category and Grand Prize Awards will be announced and recognized at the Chanticleer Awards Banquet and Ceremony on Saturday, April 27th, 2019, Bellingham, Washington. These titles are in the running for the SHORT LIST of the 2018 ROSSETTI Book Awards novel competition for Young Adult Fiction. Previous Post The wait is over! Book 3, Change of Darkness, is here!